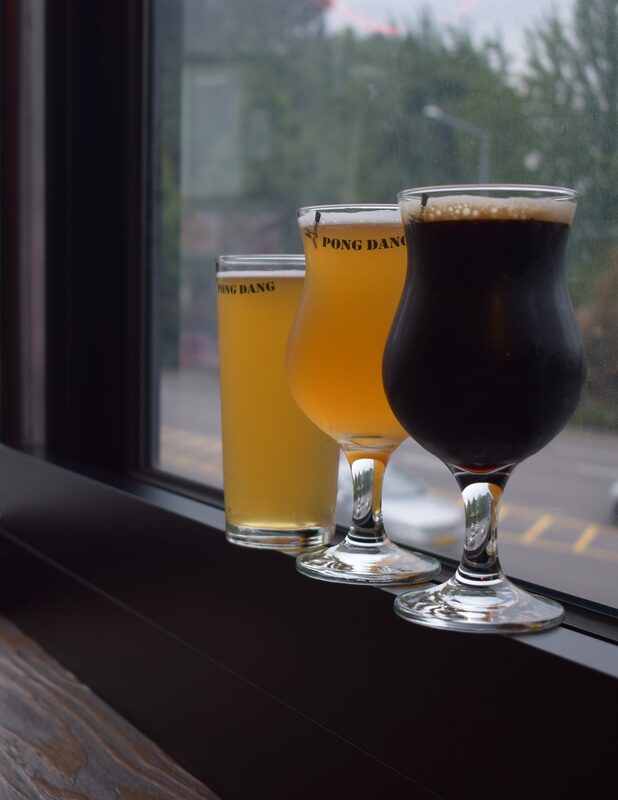 You’ll find Magpie nestled in a basement, down some dimly lit stairs, through a hard-to-find doorway, in the aptly named “Craft beer alley” right around the part of town where Itaewon transitions into HBC. Sadly, their beers aren’t brewed on location, or even in Seoul; they’re brewed a couple hundred miles away in Jeju. I’m not sure why breweries that do that bother me so much, but they do. Regardless, once we finally found the place we loved the ambiance, we split an order of their amazing, homemade hot cheeto-style rice puffs and, as they don’t offer tasting glasses or flights, a pair of pints. We started with a mainstay: The Magpie Kolsch. This kolsch was typical of the style with some warm fruity notes to start and finishing crisp and lager-clean. The next brew was Southbound Train. We were there a few weeks ago and I think it was about to be phased out or replaced by a fall seasonal, so I’m really glad I got to try it before it was gone. Southbound Train is a Baltic rum porter that was the perfect amount of boozy, sweet, and bitter all while remaining smooth throughout. There were definite notes of vanilla, toffee and dark fruits with a slight hint of coffee and I was truly impressed! I don’t think it’s fair to give them an official rating as we only tried two of their drafts. I will say Magpie Brewing Company is a much try if you’re in the neighborhood. Try the other two microbreweries and half a dozen craft beer bars that are there while you’re at it! Look for the tag (MpBC) to see where they fall in the rankings!